Rugs can be beautiful creations used to accent a room or used to wipe dirty feet. 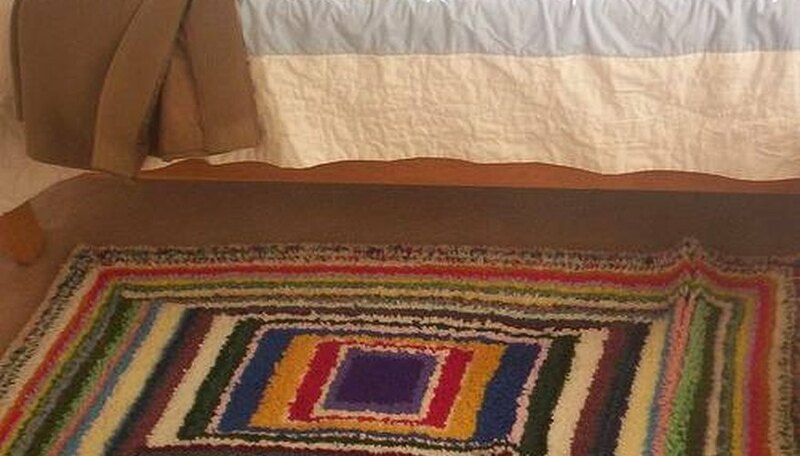 One way to get beautiful rugs without going to the stores and paying lots of money is to make your own. There are several ways to make a rug at home, one of which is hooking. Making a hook rug is simple and enjoyable, although it can be somewhat time consuming. These homemade hook rugs can also be given as gifts to friends and family. Draw a picture of your choice on the burlap as a design for your rug. You can also use linen or plastic canvas for rug backing instead of just burlap. Place the burlap over the bottom of the wooden hoop. Press the top hoop frame onto the bottom frame, and twist the knob until the burlap is tightly stretched. Make sure that the side you drew the design on is facing up. Cut the yarn into lengths of 2 1/2 inches, and then separate the cut yarn into piles according to their color. Put the separated yarn into containers with lids or zip bags so they don't get lost or mixed up with the other colors. Decide which outline and color of yarn you want to start with. All of the outlines need to be done first, then the spaces inside the outlines. Finish with the background. Hold the piece of yarn in one hand under the burlap, and hold the hook in the other hand. Stick the hook into one of the tiny spaces of the outline, and pull up one end of the yarn. Push the hook into the next space, and pull up the yarn until you have a loop between 1/4 and 1/2 inch high. Skip a space and pull up another loop. Give each loop a slight tug to make sure the yarn is flat on the underside of the burlap. Repeat Step 5 until you come to the end of the piece of yarn. Pull the tail up through the burlap, and trim both ends of the yarn so they are the same height as the loops. Change the color of the yarn as needed for each part of the pattern. Keep hooking the yarn in this manner until your pattern is finished. Old wool clothing can be cut into thin strips, dyed to the colors you want and used for rug making instead of yarn.